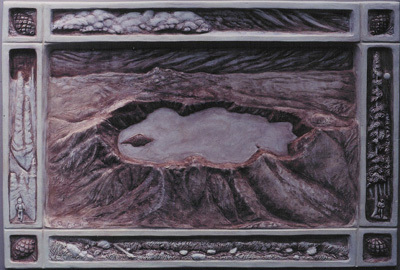 This panel depicts Crater Lake National Park in southwestern Oregon. The overall size is 15"x 22". It is cast in durable resin and is patinaed for the benefit of those with low vision. Included in the border vignettes is other tactile information about the area's natural elements, such as clouds, a stream, pine trees, and rock formations with human figures to provide a sense of scale. Unlike Braille signage, which is provided solely for the sight impaired, Martha's touchable art connects with both sighted folks and the visually impaired. As our culture develops an increased sense of concern and sensitivity for members of our community who are disabled and limited in their museum access, the Americans with Disabilities Act (ADA) has encouraged accessibility solutions so that all people may be included in the museum experience. To that end, Martha Snyder is continuing to develop an approach to tactile graphics and art that can provide the blind and visually impaired with touchable information panels, bas-relief representations of places and things, and tactile maps. Several of Martha's bas-relief pieces are shown here. 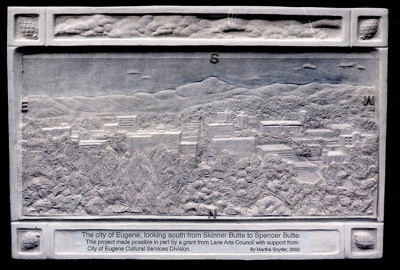 This 15"x 22" tactile panel provides a view from Skinner Butte, on the north side of Eugene, Oregon, looking south across the downtown area and on to Spencer's Butte. The piece, also cast in resin,was sponsored jointly by the Lane County Arts Council and the City of Eugene Cultural Services Division. At Left: One of a series of Martha's bas-relief interpretations of a nonobjective oil painting by noted Oregon artist Maude Kerns. This series of touchable translations of her paintings was instrumental in encouraging Martha to pursue touchable art for the sight impaired. Moments In Time Exhibits has also developed ADA access solutions into our recommended diorama display base design. 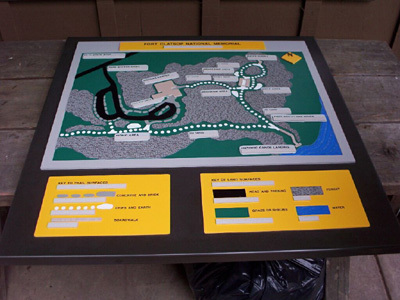 "In May of 2003 I completed a tactile map for Fort Clatsop National Memorial. It is now located in front of their Visitor's Center. The map is composed of durable materials in a variety of textures and contrasting colors so as to be useful for blind and low vision visitors. The text is simple and large, and includes Braille translations just beneath the printed text on the map and on the legend under the map. This project will be a good test of materials and composition, and I have requested feedback from the parks folks so that I may continue to fine tune similar future projects. It is my belief that tactile signage such as this educates the sighted as well by helping them to become more sensitive of the needs of the alter-abled." 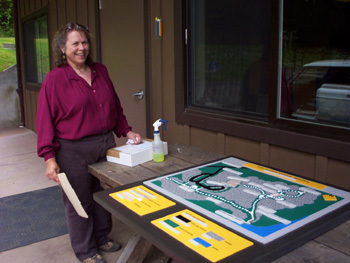 Martha adds finishing touches to the Ft. Clatsop tactile sight map. 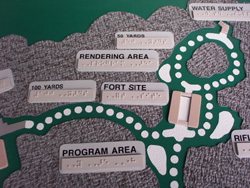 Detail of Ft. Clatsop tactile sight map. The design and application of effective signage for the visually impaired is far from a mature discipline. For exterior applications, such as with the outside, roofed location of this piece at Ft. Clatsop, resistance to weather and vandalism must be balanced against the use of various materials chosen for their unique feel and color. We think of our tactile projects as ongoing developments in partnership with the client, understanding that some repair may prove necessary over time, and that feedback from the targeted user group may foster modifications in the approach for this or other tactile communications panels.